Polymers are large molecules composed of repeated chemical units. The smallest repeating unit is called a mer. The term polymer is derived from the Greek words poly and mers meaning "many parts." Linear polymers are like ropes. For a polymer chain of 10,000 units (a typical length), a standard half-inch-thick rope would be about 128 meters (140 yards) long to represent the length-to-thickness ratio. Polymers are synthesized naturally and artificially to perform a wide variety of specialized tasks. The number of repeat units in a chain is called the degree of polymerization (DP) or chain length. Thus, a poly(propylene) chain 5,000 units long would have a DP of 5,000 and an "n" value of 5,000. 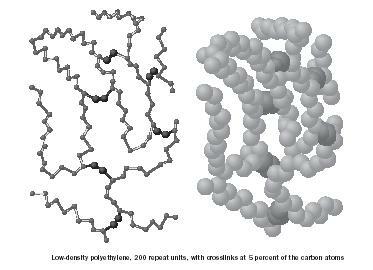 Because most polymer mixtures contain chains of varying lengths, the chain length is often referred to in terms of average chain length or average DP. At either end of the polymer chain are end groups. 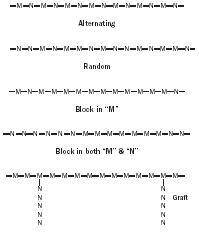 (Because the chain is often thousands of units long, the end groups are usually omitted.) For (poly)propylene (shown in Figure 1) the repeating carbons (C-C-C-C-C-C-C) form the polymer backbone and represent the atoms that connect the chain together. In vinyl polymers, so called because they are generally derived from substituted vinyl reactants or monomers (Figure 2), the polymer backbone is composed of only carbon atoms. An example is poly(propylene), which has five mers represented (Figure 3). Condensation polymer backbones include non-carbon atoms. For example, polyesters have oxygen atoms and nylons have nitrogen atoms in the backbone in addition to carbon atoms (Figure 4). Occasionally a "head-to-head, tail-to-tail" configuration occurs. For most vinyl polymers this structure occurs less than 1 percent of the time in a random manner throughout the chain. and branched structures with varying amounts and lengths of branching. Copolymers are polymers derived from two different monomers (M andN). Saran, a component of Saran Wrap, is one example (Figure 9). 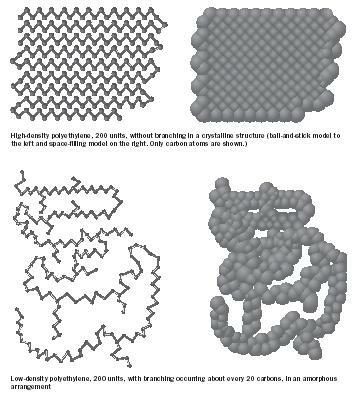 Other examples of copolymer structures are depicted in Figure 10. Some linear chains have extensions (beyond the substitution) coming off the polymer backbone. These extensions are called branches and influence a polymer's properties. Branches may be long or short, frequent or infrequent. For example, so-called low density polyethylene (LDPE) has between forty and one hundred short branches for every 1,000 ethylene units, whereas high density polyethylene (HDPE) has only one to six short branches for every 1,000 ethylene units (Figure 11). Branching discourages the chains from fitting close together so that the structure will be amorphous with relatively large amounts of empty space. Regular structures with little or no branching allow the polymer chains to fit close together, forming a crystalline structure. Crystalline structures are generally stronger, more brittle, of higher density, more resistant to chemical penetration and degradation, less soluble, and have higher melting points. For example, HDPE has a density of 0.97 gram per milliliter and a melting point of about 130°C (266°F), whereas LDPE has a density of about 0.92 gram per milliliter and a melting point of about 100°C (212°F). (Figure 12). Some materials can have only a few crosslinks, such as permanent press materials where the fabric contour is locked into place with crosslinks. Others materials such as Bakelite and ebonite are heavily crosslinked; these are hard, brittle, non-flexible materials. The properties of polymers are dependent on many factors including inter- and intrachain bonding, the nature of the backbone, processing events, presence/absence of additives including other polymers, chain size and geometry, and molecular weight distribution. While most materials have melting/freezing and boiling/condensing points, polymers do not boil because the energy necessary to put a polymer into the vapor state is greater than the bond energies of the atoms that hold the polymer together, thus they degrade prior to boiling. In order for a polymer to be flexible, its various units or segments must be able to move. The glass transition temperature (T g ) is the temperature where polymer units or segments can move but the entire chain cannot. Most vinyl polymers have T g values below room temperature so that they appear to be flexible and act as rubber and plastic materials. Most condensation polymers have T g values above room temperature and are used as hard plastics and fibers. The temperature where entire chain movement occurs is called the melting point (T m ) and is greater than the T g .
Many polymers are themselves brittle at room temperature. For these polymers to become more pliable, additives called plasticizers that allow segmental mobility, and consequently segmental flexibility, are added. For synthetic polymers such as poly(vinyl chloride) (PVC) and polystyrene (Figure 13), plasticizers are added that allow the polymers to be flexible. The inflexible regions of a polymer, such as crystalline regions, are often referred to as "hard" regions. Conversely, the flexible regions of a polymer, where segmental mobility occurs, are referred to as "soft" regions. This combination of hard and soft can be illustrated with so-called segmented polyurethanes (Figure 14). The urethane portion of such polymers is involved in hydrogen bonding and is considered "hard," while the polyether portion, flexible at room temperature, is considered "soft." These segmented polyurethanes are sold under a number of trade names including Spandex. Vulcanized rubber. In the mid-1800s, American scientist Charles Goodyear began working with rubber to try to make it more temperature stable. After many unsuccessful attempts, he accidentally allowed a mixture of sulfur and pre-rubber to touch a hot stove. The rubber did not melt but only charred a little. By 1844 Goodyear had been given a patent for a process he called "vulcanization" after the Roman god of fire, Vulcan. Vulcanization is the crosslinking reaction between the rubber chains and the sulfur. Bakelite. After years of work in his chemistry lab in Yonkers, New York, Leo Baekeland announced in 1907 the synthesis of the first truly synthetic polymeric material, later dubbed "Bakelite." It was generally recognized by leading organic chemists of the nineteenth century that phenol would condense with formaldehyde, but because they did not understand the principles of the reaction, they produced useless crosslinked materials. Baekeland's main project was to make hard objects from phenol and formaldehyde and then dissolve the product to reform it again in a desired shape. He circumvented the problem by placing the reactants directly in a mold of the desired shape and then allowing the reactants to form a hard, clear solid—Bakelite (Figure 15). It could be worked (i.e., cut, drilled, and sanded), was resistant to acids and organic liquids, was stable at high temperatures, and did not break down when exposed to electrical charge. By adding dyes to the starting materials the objects became available in different colors. Bakelite was used to make bowling balls, phonograph records, telephone housings, cookware, and billiard balls. Bakelite also acted as a binder for textiles, sawdust, and paper, forming a wide range of composites including Formica laminates. Many of these combinations are still in use in the twenty-first century. Neoprene. Chemist and Catholic priest Julius A. Nieuwland did extensive work in the 1920s on acetylene. He found that acetylene could be made to add to itself forming dimers and trimers. Arnold Collins, a chemist at the Dupont Company in the lab of Wallace Carothers, continued work on the project and in 1930 ran the reaction described by Nieuwland, purifying the reaction mixture. He found a small amount of material that was not vinylacetylene or divinylacetylene. After setting the liquid aside, it solidified into a material that seemed rubbery and even bounced. This new rubber was given the name Neoprene (Figure 16). Neoprene has outstanding resistance to gasoline, ozone, and oil in contrast to natural rubber and is used in a variety of applications including electrical cable jacketing, window gaskets, shoe soles, industrial hose, and heavy-duty drive belts. Nylon. In the early 1930s Wallace Carothers and his team of chemists at Dupont were investigating synthetic fibers in order to find a synthetic alternative to silk. One promising candidate was formed from the reaction of adipic acid with hexamethylenediamine and was called fiber 66 because each monomer-containing unit had six carbons. It formed a strong, elastic, largely insoluble fiber with a relatively high melting temperature. DuPont chose this material for production. Such polyamides were given the name "nylons"; thus was born nylon 6,6 (Figure 17). Poly(vinyl chloride). While PVC was initially formed by German chemist Eugen Baumann in 1872, scientists at B. F. Goodrich discovered in 1926 how to make sheets and adhesives from it, starting the "vinyl age." PVC's many applications include water pipes and joints, building materials, food packaging, wire insulation, and medical components. Polystyrene. While polystyrene was probably first formed by German apothecary Eduard Simon in 1839, it was almost 100 years later, in 1930, that the German chemical company I. G. Fraben placed polystyrene on the market. Polystyrene-molded parts became common place by 1935. Applications of polystyrene include loose-fill packaging "peanuts," shape-molded packaging, and disposable utensils. Polyacrylonitrile. Rohm and Haas Company bought out Plexiglas (polyacrylonitrile [Figure 18]; also known as acrylic and as a fiber sold under tradenames such as Orlon) from a British firm in 1935 and began production of clear plastic parts and goods, including replacements for glass in camera lenses, aircraft windows, clock faces, and car tail lights. Poly(vinyl butyral). The polymer poly(vinyl butyral) (PVB) was first used in automotive safety glass in 1938 to prevent flying glass resulting from automobile accidents and continues to be utilized in the twenty-first century for this purpose (Figure 19). Other important synthetic polymers. World War II helped shape the future of polymers. Wartime demands and shortages encouraged scientists to seek substitutes and materials that exceeded currently available materials. During and after the war new materials were developed, spurred by needs in the electronics, medical, communications, food, aerospace, and other industries. The aromatic nylons (armids) Kevlar (capable of stopping a speeding bullet and used as tire cord) and Nomex (used in constructing fire-resistant garments) were developed. Polycarbonates sold under the trade names of Merlon and Lexon were developed that substituted for glass in many automotive products such as tail lights. Other key developments included polytetrafluoroethylene, a slick material also known as Teflon; polysiloxanes, also know as silicones, which have an extremely wide temperature-use range and were a component of the soles of the shoes that first touched the moon; and polyester fibers and plastics such as poly(ethylene terephthalate) (PET), used in carbonated drink bottles (Figure 20). Even with this early commercial activity, little was actually known about polymers. German chemist Herman Staudinger studied the polymerization of isoprene (a five-carbon hydrocarbon containing a double bond that is obtained as a product of the degradation of natural rubber by heating) as early as 1910. Intrigued by the difference between this synthetic material and natural rubber he began to study giant molecules. Many of his fellow scientists told him there was no such thing as giant molecules and that he was wasting his time. By 1920 he published a summary of his studies and correctly proposed linear structures for polystyrene and polyoxymethylene. X-ray studies were used to support the concept of macromolecules. Wallace Hume Carothers is considered to be the father of synthetic polymer science. In 1927 the DuPont Company began a program of fundamental research in the areas of colloid chemistry, catalysis, organic synthesis, and polymer formation. Carothers, then a Harvard instructor, was persuaded to join the DuPont group. Carothers looked at the construction of giant molecules from small molecules to form synthetic polymers. His intention was to prepare molecules of known structure through the use of known organic chemistry and to "investigate how the properties of these substances depended on constitution." Over the course of his career, Carothers filed for over fifty patents and was involved in the discovery of nylon and the synthetic rubber neoprene. From his studies Carothers established several concepts. First, polymers could be formed by employing already known organic reactions but with reactants that had more than one reactive group per molecule. Second, the forces that bring together the individual polymer units are the same as those that hold together the starting materials: namely, primary covalent bonds. Much of the polymer chemistry names and ideas that permeate polymer science were standardized through his efforts. Elastomers. Elastomers are polymers possessing chemical and/or physical crosslinks (Table 1 and 2). These crosslinks allow the stretched, deformed segments to return to their original locations after the force is removed. The "use" temperature must be above the T g to allow ready chain slippage as the rubbery material is flexed and extended. The forces between the chains should be minimal to allow easy movement of these chain segments. Finally, the chains must be present in an amorphous, disorganized fashion. As force is applied and the material distorts or elongates, the randomly oriented chains are forced to align and take more ordered positions with the chains, forming crystalline regions that resist ready movement. As the force is removed the material has a tendency to return to its original disorganized state and therefore its pre-stretched shape. The formation of the crystalline regions as the material is stretched gives the material a greater tensile strength(i.e. an increased force is necessary for further elongation) at high extensions. Crosslinked vinyl polymers are ideal materials to be used in elastomers: the attractive forces between chains is low and their T g is below room temperature. Thermosets and thermoplastics. Thermosets are materials that have sufficient crosslinking present so that they are prevented from being soluble and melting when heated. Such materials are therefore difficult to recycle. Thermoplastics are materials that melt on heating and generally contain little or no crosslinking. They can be recycled more easily through heating and reforming. Linear polymers are thermoplastic materials. Fibers. Fibers require materials with a high tensile strength and high modulus (high force required for elongation). This requires polymers with strong forces between the chains and chains that are symmetrical to allow for good crystalline formation. Condensation polymers exhibit these properties and so are most utilized as fibers. Fibers are normally linear and drawn (pulled) in one direction, producing higher mechanical properties in that direction. If the fiber is to be ironed, its T g should be above 200 o C. Branching and crosslinking are undesirable since they inhibit crystalline formation. Even so, some crosslinking may be present to maintain a given orientation, such as desired in permanent press clothing. 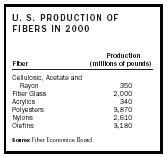 While most fibers are made from condensation polymers, new treatments allow some fibers to be made from olefinic materials such as polypropylene (Table 3). 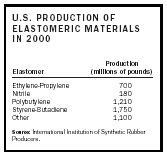 Source: International Institution of Synthetic Rubber Producers. Plastics. Plastics require properties that are intermediate between elastomers and fibers. Engineering plastics can be readily machined, cut, and drilled. Condensation polymers are typically engineering plastics while vinyl polymers are typically plastics. Table 4 contains a listing of the most common engineering plastics and plastic materials and Table 5 the volume of engineering plastics and plastics produced in the United States. Oil paints consist of a suspension of pigment (colorant) in a drying oil such as linseed oil. Oil varnishes consist of a polymer, either natural or synthetic, dissolved in a drying oil together with the necessary additives such as catalyst that promotes crosslinking of the drying oil. Enamels are oil varnishes with pigment added. Lacquers are polymer solutions to which pigments have been added. Latex paints are polymer latexes, often poly(methyl methacrylate) and polyacrylonitrile, to which pigments have been added. They account for well over one half of the commercial paint used. Hardening or drying consists of removal of solvent (evaporation) and/or crosslinking of a drying oil that contains C=C units. Solvent-based adhesives like model airplane glue contain a volatile solvent that dissolves part of the plastic and when dry forms a solvent weld. Pressure-sensitive adhesives like those used on Post-It-Notes often contain the same adhesive material used in more permanent adhesives like Scotch Tape except in lesser amounts. Reactive adhesives are short chained polymers or monomers that solidify through polymerization or crosslinking after application. Plywood is formed from the impregnation of thin sheets of wood with resin that dries after the sheets are pressed together. Phenolic thermosets such as those developed by Bakelite are often used as the resins for plywood. Adhesives made from cyanoacrylates are among the best known adhesives, sold under trade names such as Super Glue and Crazy Glue. Monomers such as butyl-alpha-cyanoacrylate (Figure 16) polymerize spontaneously in the presence of moisture. The presence of the cyano and acrylate groups, both quite polar, makes this a particularly good adhesive; it is used in surgery and for mechanical assemblies. Sealants and caulks. Sealants and caulks provide a barrier to the passage of gases, liquids, and solids; maintain pressure differences; and moderate mechanical and thermal shock. While adhesives are used for "load transfer" and require high tensile and shear strengths, sealants act as insulators and shock attenuators and do not require high tensile and shear strengths. Films and sheeting. Films are two-dimensional forms of plastic, thick enough to be coherent, but thin enough to be flexed, creased, or folded without cracking. Most films are produced from materials from the elastomeric and plastic categories. Sheeting is a two-dimensional form of plastic that is thicker (generally greater than 250 micrometers) than film and is generally not easily flexed, creased, or folded without cracking. Composites. Composites are materials that contain strong fibers or reinforcement embedded in a continuous phase called a matrix. They are found in jet fighters such as stealth fighters and bombers, in the "reusable" space shuttle, in graphite golf clubs, in synthetic human body parts, and for many years in marine craft (fibrous glass). Laminates. The combination of an adhesive and an adherent is a laminate, a type of composite. Commercial laminates are produced on a large scale with wood as the adherent and phenolic, urea, epoxy, resorcinol, or polyester resins as the adhesive. Plywood is an example of a laminate. Laminates of paper or textile include Formica and Micarta. Laminates of phenolic, nylon, or silicone resins with cotton, asbestos, paper, or glass textiles are used as mechanical, electrical, and general purpose structural materials. Conductive polymers. Most polymers are nonconductive and polymers such as polyethylene, polypropylene and polytetrafluoroethylene (Teflon) are used as insulators. Even so, some polymers have been found to conduct electricity. An example is polyacetylene; oxidation with chlorine, bromine, or iodine vapor makes polyacetylene film 10 9 (1,000,000,000) times more conductive than the non-treated film (Figure 17). This treatment with a halogen is called "doping." 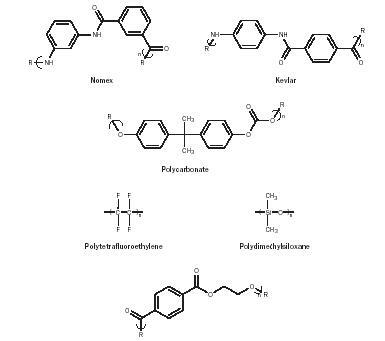 Other polymers including polyaniline, polythiophene, and polypyrrole have been found to be conducting after doping and these materials are now being used in a variety of applications (Figure 18). Doped polyaniline is employed as a conductor and as an electromagnetic shielding for electronic circuits. Polythiophene derivatives are used in field-effect transistors. Polypyrrole is used in microwave-absorbing "stealth" screen coatings and in sensing devices. Poly(phenylene vinylidene) derivatives are used in the production of electroluminescent displays. The process by which polymers are formed from monomers is called polymerization. Polymerization occurs by one of two basic reactions: addition or condensation. In addition polymerization, entire monomers are linked together to form long chains. In condensation polymerization, some small molecules (such as water) are released as polymer is formed. Polymerization reactions may be divided into two major categories: stepwise processes and chain-type processes. In the step-wise process, reactants are brought together and heated. Initially short chains are formed and only at the end of the reaction are long chains formed. Reactions generally require hours to form the polymers. It is by this process that condensation polymers are generally made. Initiation. This first step requires that the monomer's double bond is broken. This can occur by means of heat or light, or by the addition of other chemical compounds that have less stable bonds. The decomposition products of these chemical compounds add to the vinyl monomer, causing the double bond to break. These materials are called initiators because they start the polymerization process. Propagation. This second step involves growth of the polymer chain by the addition of monomer units. This occurs rapidly, within fractions of a second. Termination. Finally, the growth of the chain is stopped (terminated). The process of initiation, growth, and termination continues until the monomer is consumed. Reactions often occur at or below room temperature. Starting materials are often referred to as feedstocks. Most of the starting materials (monomers) employed in the synthesis of synthetic polymers like polystyrene, polyethylene, and nylons are derived indirectly from fossil fuels. The term fossil fuels refer to materials formed from the decomposition of once-living matter. Melt process. Also referred to by other names including high melt, bulk melt, bulk, or neat. The melt process is an equilibrium-controlled process in which polymer is formed by driving the reaction toward completion, usually through removal of the byproduct or condensate. Thus, in the reaction of a diacid and a diol to form a polyester, water is removed, causing the reaction to proceed towards polymer formation. The reactants are employed "neat" (without solvent); any other needed materials such as catalysts are added to the reaction vessel. Heat is applied to melt the reactants, permitting them to come into contact with one another. Additional heat can be added and the pressure reduced, but heat control is important since most of these reactions are exothermic. These reactions typically take several hours to days before the desired polymer is formed. The product yield is necessarily high. Solution process. Solution polymerizations are also equilibrium processes, with the reaction also often driven by removal of the small byproduct. The product may be recovered from the reaction system through addition of the reaction liquid to a non-solvent, removal of the solvent, or direct precipitation of the polymer from the reaction system. Because the reaction is often run at a lower temperature, more reactive reactants are generally required. Suspension process. Water-insoluble monomers can be polymerized as suspended droplets in a process called suspension polymerization. Coalescing of the droplets is prevented by use of small amounts of water-soluble polymers such as poly(vinyl alcohol). Emulsion process. The emulsion process differs from suspension polymerization in the size of the suspended particles and in the mechanism. Manufacturers. Over 200 companies produce the "bulk" polymers that are used by the other two groupings of companies. While most of these produce the bulk polymers in large quantities, some produce what are called "specialty polymers," those used in special applications on a small scale. Processors. 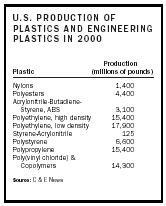 While some companies produce their own polymers, most purchase the raw polymer material from a manufacturing company. Processors may specialize in the use of selected polymers, such as polypropylenes, polyethylenes, or nylons; in a particular mode of processing; or in the production of particular markets such as films, sheets, laminates, adhesives, or coatings. Fabricators and finishers. The large majority of companies are involved in the fabrication and finishing of polymer-containing products. Fabrication can be divided into three broad areas: machining, forming, and fashioning. SEE ALSO Adhesives ; Fibers ; Nylons ; Plastics ; Polyesters ; Polymers, Natural . Carraher, Charles E., Jr. (2003). Giant Molecules: Essential Materials for Everyday Living and Problem Solving , 2nd edition. Hoboken, NJ: Wiley. Carraher, Charles E. Jr. (2003). Polymer Chemistry. New York: Dekken. Craver, Clara D., and Carraher, Charles E., Jr. (2000). Applied Polymer Science: 21st Century. New York: Elsevier. Morawetz, Herbert (1995). Polymers: The Origins and Growth of a Science. New York: Dover. Salamone, Joseph C., ed. (1999). Concise Polymeric Materials Encyclopedia.M Boca Raton, FL: CRC Press.